Contra Costa Superior Court Judge Joni Hramoto swore into office Supervisors John Gioia as Chair and Candace Andersen as Vice Chair of the Board of Supervisors on Tuesday, January 15, 2019 as Supervisor Federal Glover looks on. Photo by Daniel Borsuk. 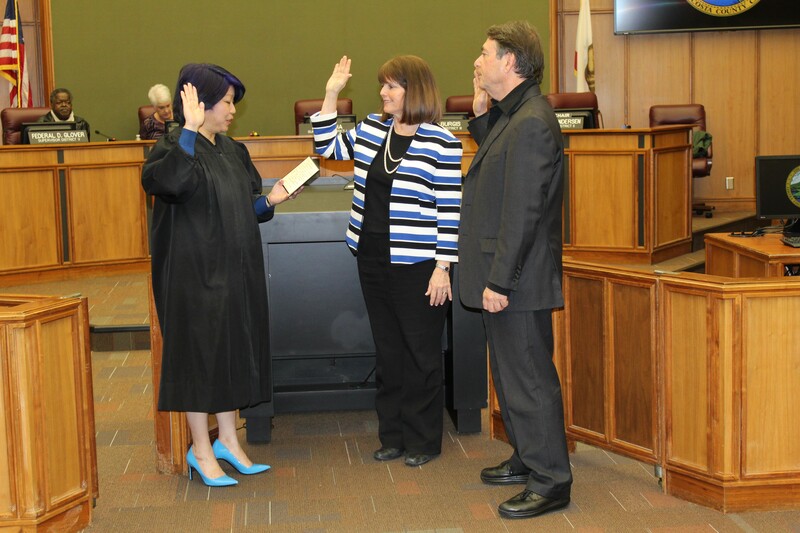 Contra Costa Superior Court Judge Joni Hramoto swore into office Contra Costa County Supervisors John Gioia of Richmond as Chair and Candace Andersen of Danville as Vice Chair of the Board of Supervisors on Tuesday. Both were unanimously elected to their posts. Gioia, who was reelected last November to his fifth four-year term, aims to reduce health care costs for county employees, reinstitute the children’s report card that before 2007 focused on children outcomes and development strategies, and to introduce an asthma medical program for disadvantaged youth. Gioia, who last year was board vice chair, replaces District 4 Supervisor Karen Mitchoff of Pleasant Hill. Mitchoff, who said she read 67 books during a busy personally tragic year where she lost her 62-year-old brother Gerald Mitchoff in a South Lake Tahoe shooting incident in June, saw the county maintain its AAA Moody’s bond rating, began construction of a new $100 million county administration building and new $30 million emergency communications building both in Martinez , and helped usher voter passage of the cannabis sales tax measure in November.